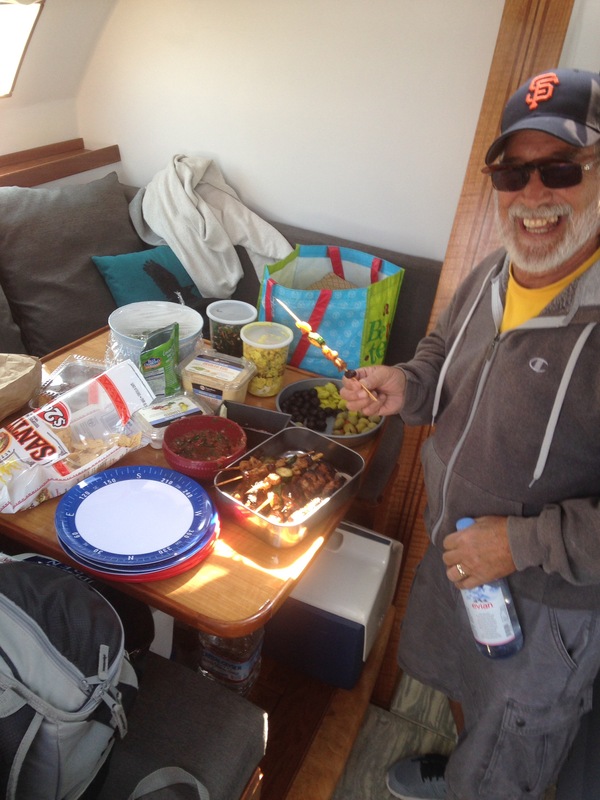 A big rigging question was peoples’ skepticism on our Vee mainsheet setup. 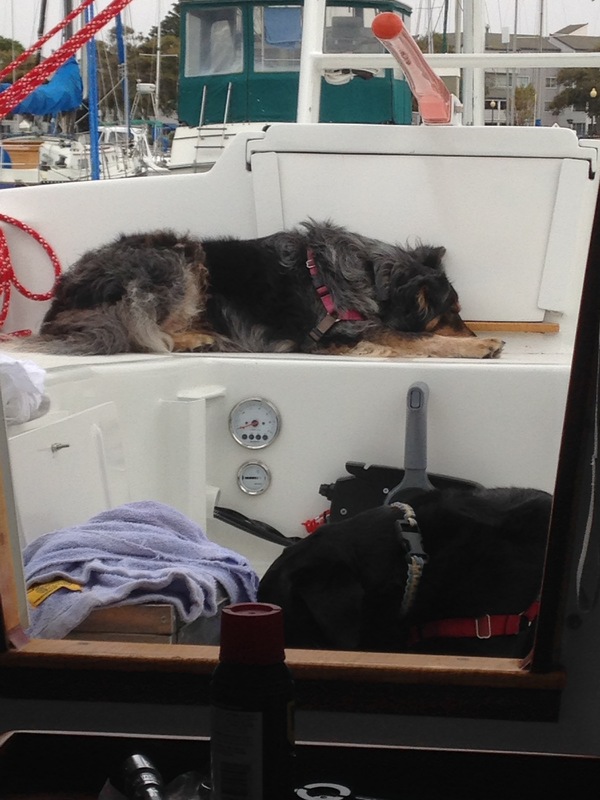 See the red mainsheet behind DonK driving the boat yesterday. That’s one line, and each bitter end leads to a winch. Note how the final leg of the left-hand block set feeds the line over to the right-hand side. We’re learning how and when to pull that crossover line to travel the boom windward/leeward. You can do it by hand under lighter sheet loads. 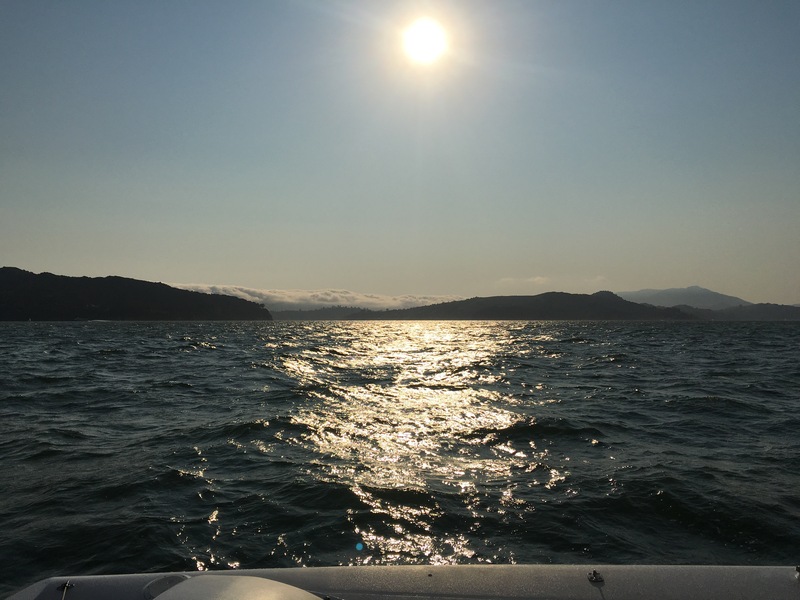 But 3 of the 4 sailing days so far have been 20+ knots breeze; for that trimming the windward winch is traveling the boom across the boat and sheeting the leeward winch pulls the boom down (mainsheet tension). The big Andersen ribbed winches hold the mainsheet very well, so if we’re wanting to sail on the edge and have a safety fast “blow the main!” I think two people could each hold an end with four winch wraps and no self-tailer grab. So far I’m really happy with this no-traveler deck arrangement. Next we want to figure out the reefing full batten jib. Here it is with the reef put in, but all the excess sail not gathered. 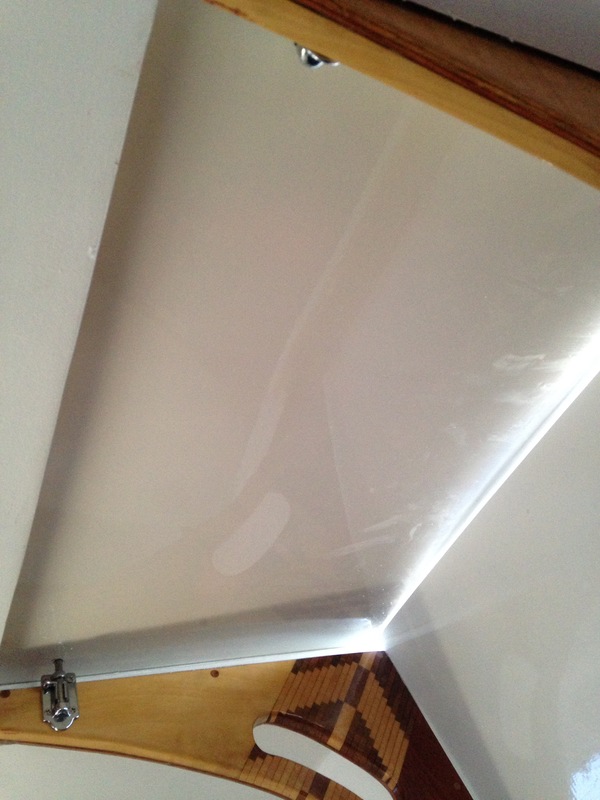 It’s very high-clewed, forming a steep diagonal line foot of the sail. While it looks easy in the photo to just roll that stuff up, it’s very large and the spectra sailcloth is very stiff (a good thing!). Doing this at sea in deteriorating weather will be a nasty job to be avoided – take the reef way before things get sloppy out there. 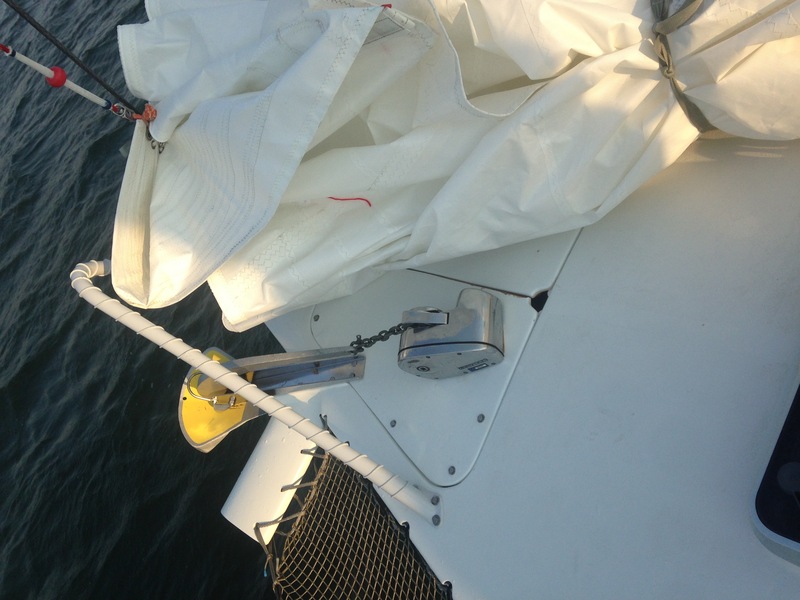 The horizontal zipper in the photo accepts a cover for the rolled/ folded excess sail when reefed. We’re very much inviting curious, patient sailors out over the next month to trial all these sailing control tweaks. Finish work continues. 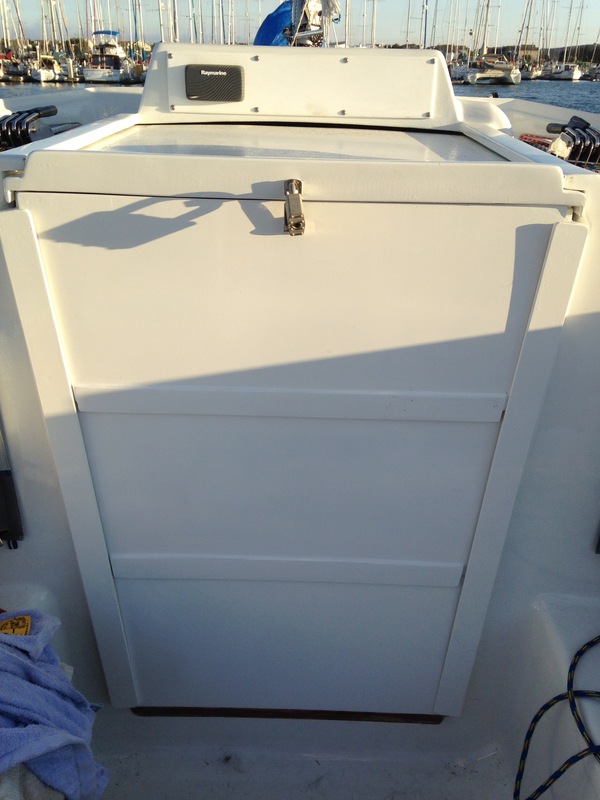 Companionway doors finally replaced the plywood version. Coco models the aft cabin entry while Lola’s snout points out the engine controls. 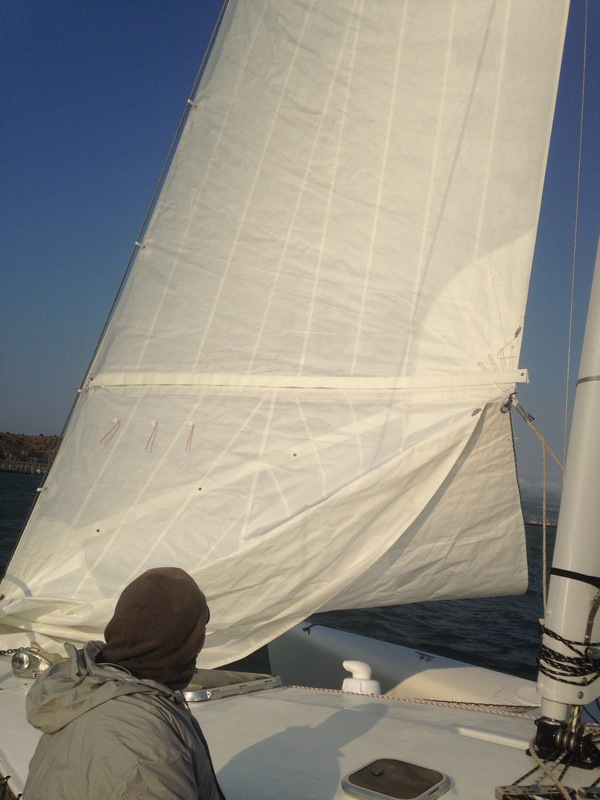 Last week we got our only mellow sail so far. 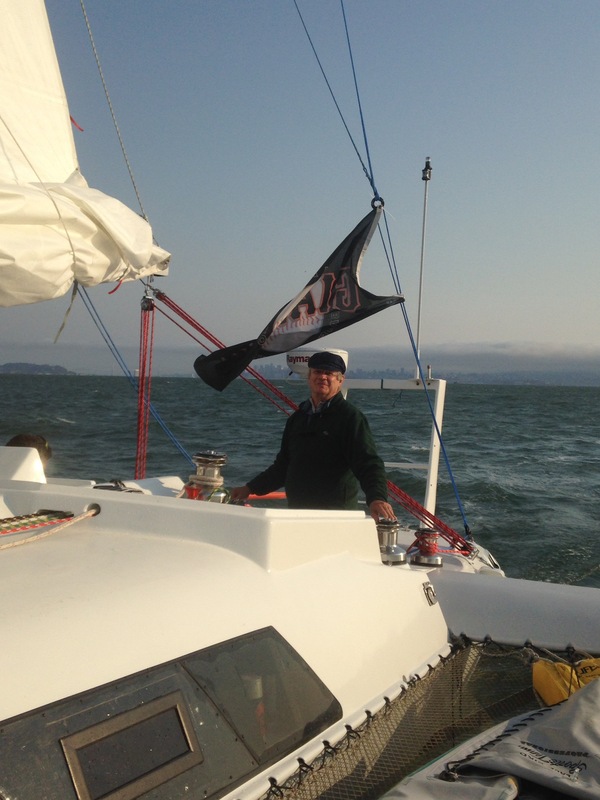 Charlie, Leslie, Griffin and I headed up Racoon Straits for Sausalito. 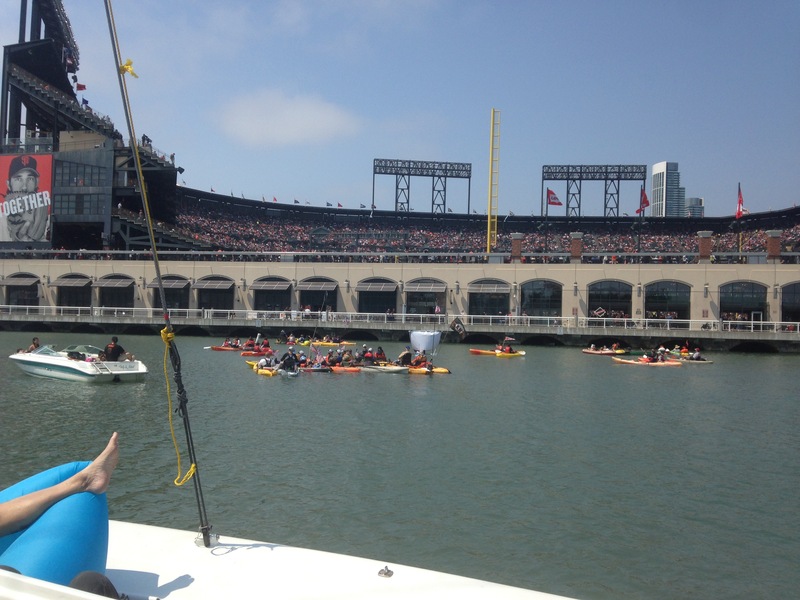 The boat glides upwind in the flatter water and we picked off every 40′ boat we could find. So fun to crawl up to their tails and wave. 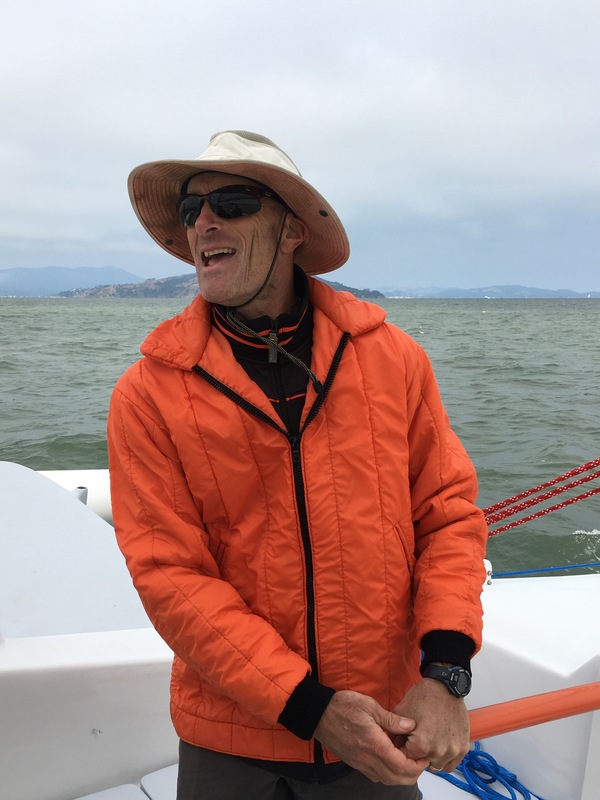 There was wind out past the Marin shore, but the skipper gybed the boat for home instead – just really wanted ONE zero stress casual sail after five years of F36 angst. I want more days like this. Yesterday was Ravenswing’s first “cruise”. 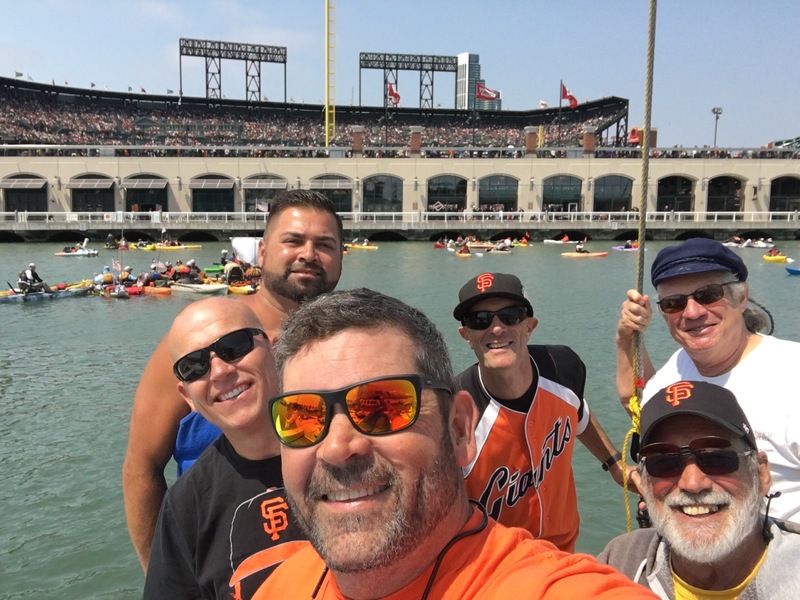 Destination McCovey Cove, crew was the business owners from the shops surrounding our build shed of 2012-2016. 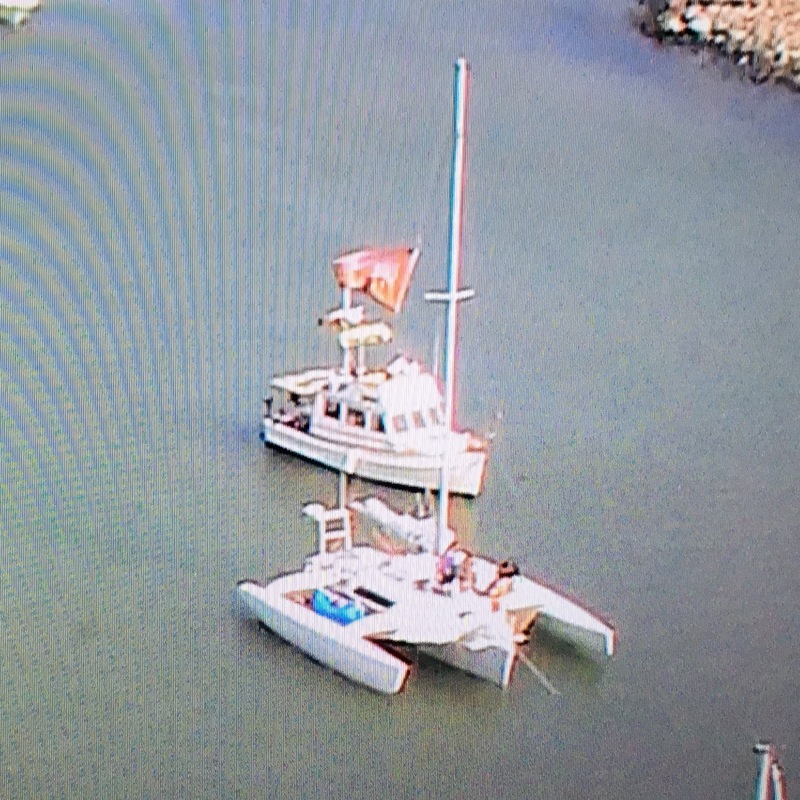 (Yea, the guy on the GrandBanks anchored way too close which was a problem when we swung in the wind). This gear worked well, and what a joy to push a button! What we won’t show you was the steep learning curve, including anchor chain-to-rope-rode shackle that can’t go thru windlass (duh! ), big billows of excess mainsail when reefing because someone hasn’t installed reefing gather lines, dragging anchor because we didn’t back down on it the first time, jammed up mainsail douse because we weren’t head to wind, and no dishwashing water because the same person who didn’t check the gas tank when we left Napa didn’t check the water tanks Saturday morn. All humble pie, and nothing damaging. 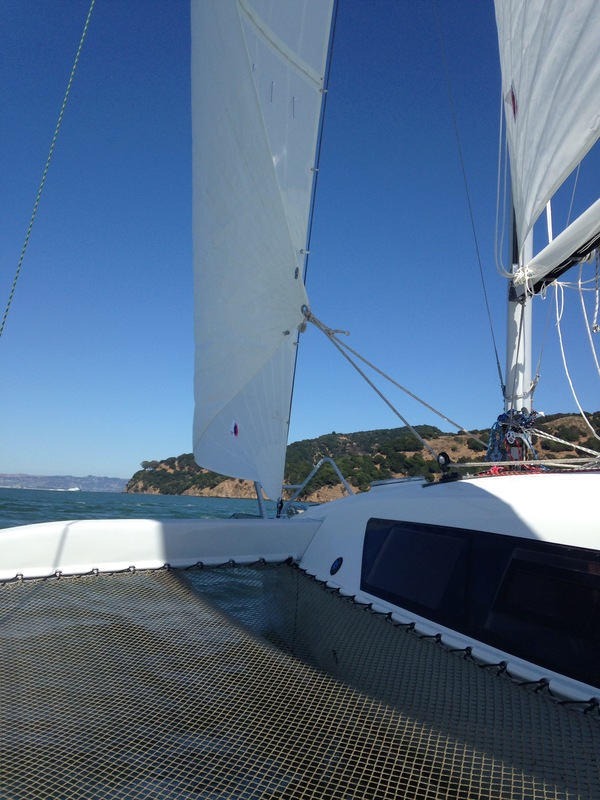 Nearby readers, let’s go sailing next weekend. Let me know which day works for you! 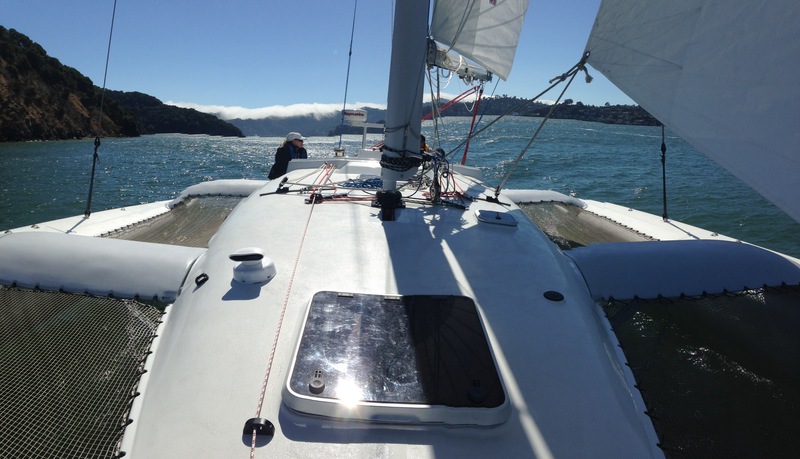 This entry was posted in Deck & fittings, Inspirations in sailing, rigging, Uncategorized by cartersboat. Bookmark the permalink.